shared bicycles arrive bike are coming back to the streets of Nitra. Citizens and visitors of the city can use the successful bikesharing service, which met positive feedback last year. Citizens and visitors have been so far able to rent bicycles through the bicycle computer or mobile app available on Google Play and the App Store. A new feature of this year is the opportunity to use ARRIVA NITRA public transport cards to rent shared bicycles. 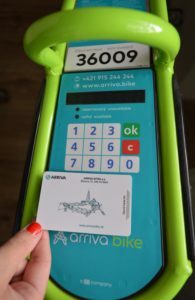 To rent bicycle via the public transport card, is registration required at arriva.bike webpage or through the app arriva bike. The payment is executed automatically via credit card, after finishing the rental. We are looking forward to seek adventure with you in Nitra again. Mo – Su: 8.00 a.m. – 8 .p.m. Preparing For The New Season 2018 #arrivabikesutaz2018 photo contest is here!